The question is: why should one back up the saved game positions? My answer says that there can be hardware failure, malware attack or just one simple thing. You will accidentally overwrite the previous saved game’s state with another one – and with bad situation in your game. The simple solution can be special backup software called GameSave Manager. This software supports many PC games and you can edit their settings. After the easy installation the GameSave Manager starts and you can Create a Custom GameSave Entry (for the games not directly supported), Adjust Program Settings or Check for Updates. Backing up the games is very simple. Close the welcome window after the SaveGame Manager starts and click the Backup GameSave(s) button. 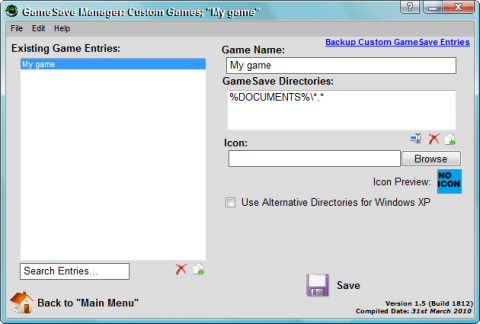 SaveGame Manager will scan your folder for the games currently installed and will backup all necessary files. Restoring your backups with saved games is very easy. Just click the Restore GameSave(s) button from the main window. If you have a special game on your PC and the GameSave Manager is not able to find it, you can define your own settings. But at first, click the File > List currently supported games menu. There are currently 457 games supported. For a new game backup, click the Custom GameSave Entries button within the main window. In the new window, click the bottom button to create a new entry. Name your PC game, select the directory where the saved states are and provide a file mask. You can also add your own icon. Finally click the Save button and try to backup your game. 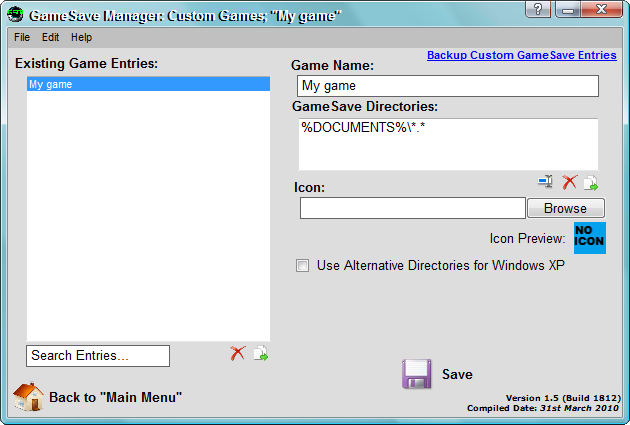 The SaveGame Manager can run in the background and automatically backup the saved games for you. To do this, click the Scheduled Tasks button and set the interval when the backup will run. Do not forget to save these settings. The newest version of SaveGame Manager also supports 7-Zip compression to create smaller backup files. This feature is currently in BETA state and you can enable it using the Program Settings button on home screen. 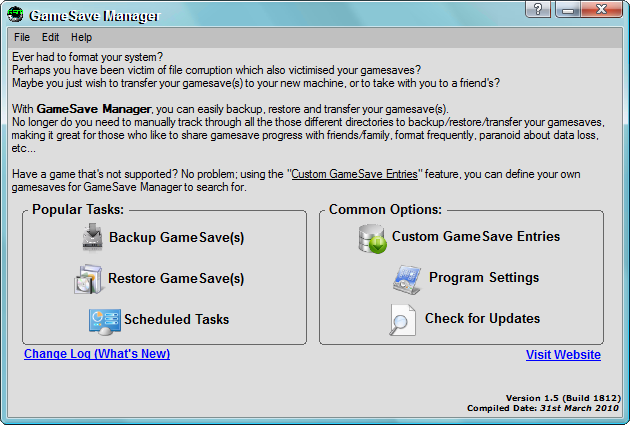 SaveGame Manager is nice free software four your PC games backup. Use it and forget to afraid of your saved games positions. 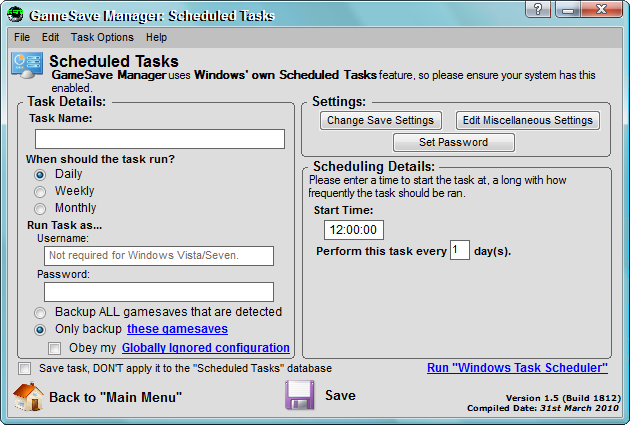 You can download SaveGame Manager from its homepage at gsm.duncsweb.com.